In the very northwestern part of YunNan province, near the border of Tibet Autonomous Region, again here the scenery and locals are very different from other parts of YunNan. Still in February, most parts of YunNan are nicely warm and blossoms are everywhere. In this corner of the northwest part, temperatures were still cold in mornings, sub-zero was easily detected from frozen water tops and frosted grass. 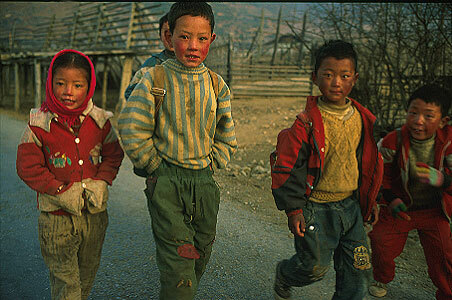 Braving the chilly morning, a group of cheerful and playful local Tibetan children were on their way to school.